For more than 25 years, Vanguard Cleaning Systems® has developed expertise in handling automotive janitorial services. Quality automotive dealer cleaning for car dealerships, showrooms and service areas are essential to customer impressions and sales, which is why it is vital to keep high-traffic floors, waiting rooms and sales manager offices clean and free from dust and clutter. 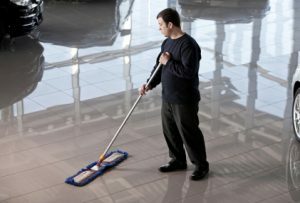 Vanguard Cleaning Systems has expertise in handling the janitorial cleaning needs of the automotive industry – from cleaning the front desk, offices, service bays, showrooms and windows to addressing concerns about grease, grime, and valuable inventories. The equipment and the programs of Vanguard Cleaning Systems give you the confidence that their cleaning services meet your expectations. Ask your local Vanguard Cleaning Systems team to show you how microfiber cloths, high-filtration vacuums, and advanced cleaning techniques can benefit your high-traffic showrooms and automobile repair facilities. For automotive facility cleaning and janitorial services, contact Vanguard today to request a quote.